Follow Sampson on Instagram @nailart.stella. 1. Prep the nails for gel-polish application. Apply a base coat and cure. Apply two coats of black gel-polish and cure. 2. With a line brush, apply light beige acrylic paint in a circle shape. Let it dry. 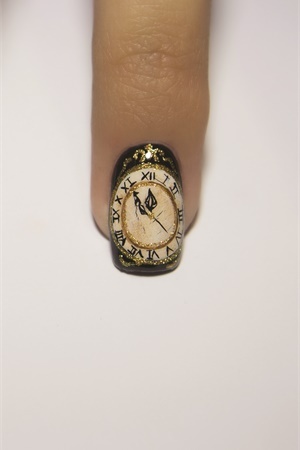 With a makeup sponge, apply darker beige and brown acrylic paint to give the clock a vintage effect. With a needle, add some “cracks” to the inside of the clock. 3. Using a detail brush, make a dot at the center of the circle and draw a thin line, leaving a little space to draw the Roman numerals of the clock. 4. 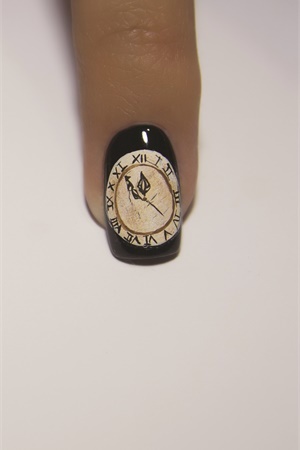 With the same detail brush and black acrylic paint, draw the Roman numerals just above the brown line. Start from the quarters and fill the rest of the numbers in later in order to achieve symmetry. 5. 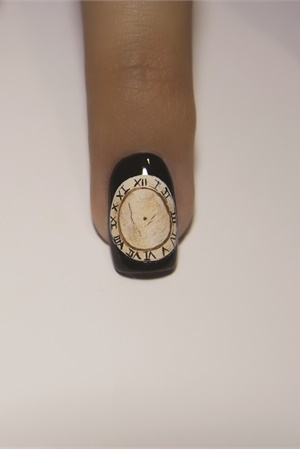 With black acrylic paint, draw the hour hand first, then the minute hand, and lastly the second hand. 6. Apply top coat and cure. 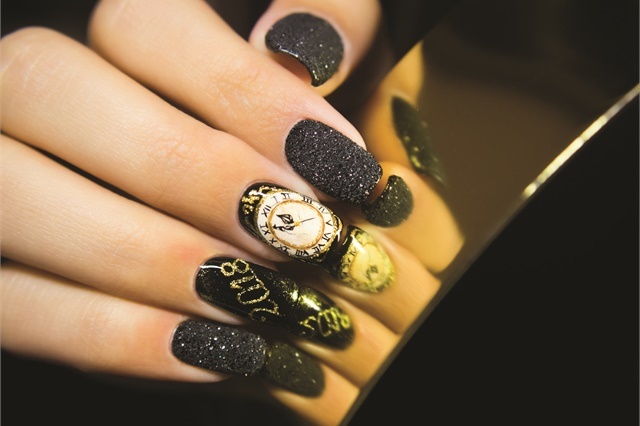 Using tack-free gold gel, add some details around the clock and in the inside lines in order to give a more festive and 3-D look. Cure. Full Set: For the other nails, apply a base coat and cure. Apply two coats of black gel-polish and cure. 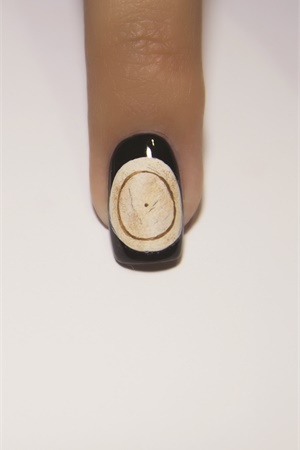 For the ring finger, use a sponge to add some very fine glitter on the top left and the bottom right corners of the nail. Apply a top coat and cure. With tack-free gold gel and a detail brush, write the numbers “2018” and cure. For the remaining nails, apply top coat and sprinkle black glitter before curing. Cure. Finally, use a very soft brush to remove the excess glitter and leave the nails with that sugary effect.